Before I show you Erin’s fabulous photography check out Joanna Goddard’s post about the funny way I met my husband on the Glamour Magazine blog Smitten. Erin Gleeson and I met on the rooftop of our building on the night of the big New York black out and have been friends ever since. We share a love for food and art about food. I’m so excited to announce Erin’s exhibit in Manhattan at the Broadway Gallery in Soho on December 19th. 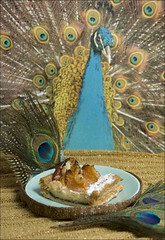 Come for holiday sweets and drinks and to see photographs from Erin’s new “Payard Series”, featuring Francois Payard’s desserts. 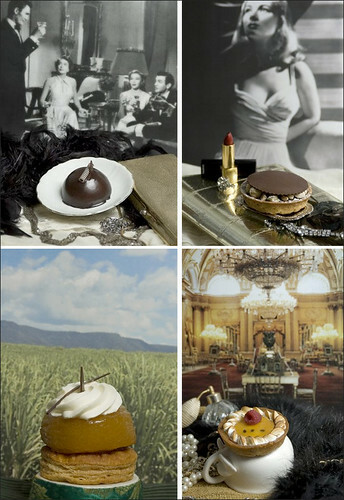 I love the way she juxtaposes glamorous photos and rich fashion textures with luscious pastries in the foreground. To see more of the images, please click here. For gallery info/press release, click here. To read Erin’s blog (Culinography, perfect name huh? )post on the show click here. Erin Gleeson finds glamour and beauty in cuisine both everyday and exotic in her photography. In the ‘Payard Series’ Erin teamed up with the renowned pastry chef Francois Payard to create ethereal, colorful collages that mingle food and fantasy. I hope to see you at the show! loved the story on smitten about you and your husband! so cool! thanks Chelsea….I would do anything to go back in time and see us playing together at camp. Wish I could remember! Thanks Ana, I was glad to share it with Smitten! thanks, sammy! look fw to seeing you tomorrow! Well thanks for featuring it Joanna! I am smitten with Smitten and as always I’m an avid A Cup of Jo reader. You are a fab writer and blogger Jo! Thanks for keeping things interesting on the blogosphere. can’t wait to see you Er. I’m so proud of you. You’re work is stellar. Can’t wait to see it on the gallery walls!